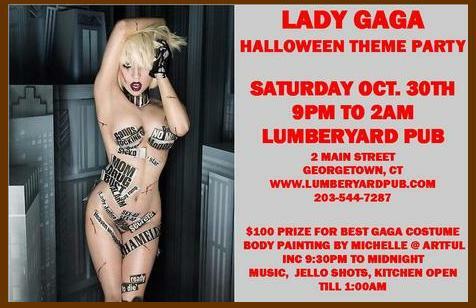 SKELETONS GOES GAGA AT THE LUMBERYARD! Skeletons is such an unusual book, I decided to do something unusual in celebration of its release—I’m going GAGA—Lady Gaga, that is—at The Lumberyard Pub. I’ll have a reading and signing of Skeletons in the Swimmin’ Hole from 7 p.m. to 9 p.m. on Saturday, October 30, just before The Lumberyard’s Lady Gaga Halloween Theme Party—which will run until 2 a.m. and include a $100 prize for the best Gaga Costume, body painting by Michelle at Artful Inc., live music, Jello shots, and more! ← SKELETONS TO HAUNT BANK STREET!